Interrupt: When you deploy an attachment, reduce its cost by 1. Combat Action: Exhaust this support to deploy an attachment from your hand. Battle: Deal 1 damage to each enemy unit at a target HQ or adjacent planet. Battle: Discard 1 card at random from your opponent’s hand. Play only during a battle. Combat Action: Each [ORK] unit you control gets +2 ATK until the end of the battle. Reaction: After you play a [DARK ELDAR] event card, pay 1[RESOURCE] to put a Khymera token into play at your HQ. The Eldar Guardians are the militia of the Craftworld, called upon to defend their home in times of war. Reaction: After this unit is declared as an attacker, look at the top 2 cards of any player’s deck. You may discard 1 of those cards. Interrupt: When you deploy an [ORK] unit, reduce its cost by 2. Deal 1 damage to that unit after it enters play. Interrupt: When you deploy an [ORK] unit, exhaust this support to reduce that unit’s cost by 1. Reaction: After this unit damages a non-warlord unit, rout that unit. Forced Reaction: After a unit you control is assigned damage by an attack at this planet, reassign 1 of that damage to attached unit. Reaction: After this unit declares an attack against an enemy unit, deal 1 damage to a different enemy unit at the same planet. Reaction: After an army unit you control at this planet leaves play, ready this unit. 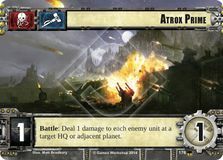 Action: Destroy a target Limited card. 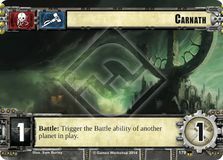 When a planet refuses to join the Tau in the Greater Good, the Tau respond by crippling the planet’s major industries before giving them a chance to reconsider. Reaction: After an enemy unit at this planet is destroyed, gain 1[RESOURCE]. 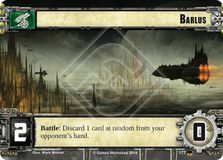 Battle: Trigger the Battle ability of another planet in play.